While I'm dorking out about the Corning Museum of Art and Glass, I noticed that they are currently displaying a show that I saw last year at the Getty Villa in Malibu. Entitled "Reflecting Modernity", the show focuses on modern work that is inspired by Roman Glass. The Romans' approach to glasswork was every bit as evolved as their approach to debauchery. In many cases, Roman techniques have been lost to time, and modern craftspeople have to put on their Sherlock Holmes hats to figure them out. I was stunned by the Roman "cage cups", which are glass cups and lamps that are so intricately carved that the exterior appears to be a delicate latticework. 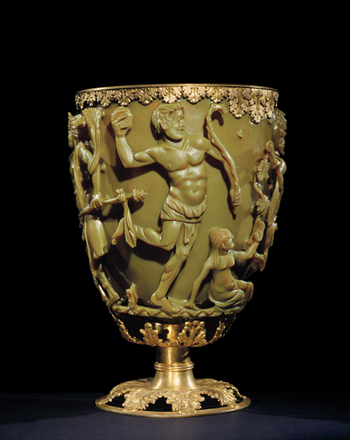 That examples of these cups have survived since antiquity is amazing. If you're going to be traveling through Central New York, make a detour to see this show. If not, you can check out the Museum's Reflecting Antiquity mini-site. As is their custom, the museum has posted many audio and video samples to give you more information.